Conduct a science project experiment to determine if different brands of crayons melt at different speeds. You can incorporate the project into a science lesson as a group project or guide students to use the concept as an individual science fair topic. Crayon melting projects also offer the chance to incorporate a recycling lesson. The crayons used during the experiment can be broken pieces poured into simple molds for future artistic projects. Crayons are made from a combination of pigment dyes and paraffin wax. Although the materials melt at fairly low temperatures, students should be supervised during the experiment. Typically crayons melt when heated to at least 125 degrees. All paper wrapping should be removed from the crayons before melting. 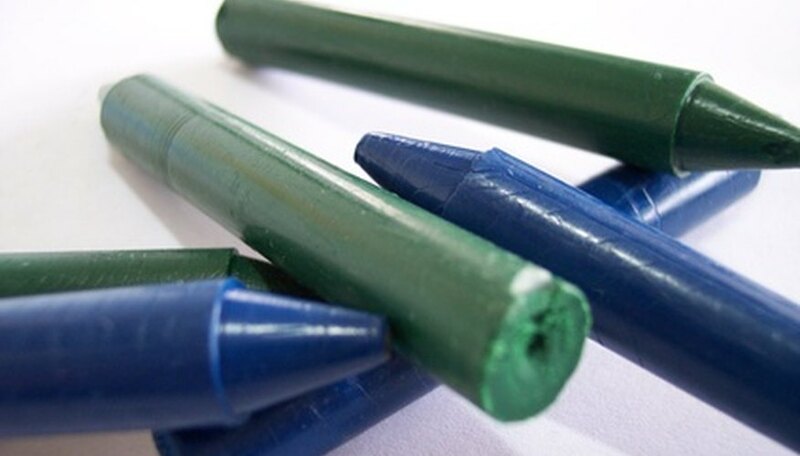 If you are using crayon shavings and not whole crayons, gather the material by brand and weigh before melting. Accurate results require each sample to be identical in weight. The color of the crayons will not be a factor in the melting time. Although you can simply place the different brands of crayons in labeled paper cups and toss them into the microwave, the method does not allow for direct observation. In order to be able to view and record the amount of time it takes for each brand of crayon to melt, you should use the double-boiler method. For the sake of safety and decreased confusion, melt only one brand of crayon on the stove-top inside a doubler boiler at a time. Either use different pots for melting each time, or allow the pots to cool thoroughly between uses. The metal utensils will hold heat and cause your results to be based upon differing heat variables. A chart will need to be generated to record each brand used in the science project and the amount of time it took for the solid to liquify. You will need to constantly stir the melted crayons or they will stick to your pot. The crayons will melt quickly and there will be little variation among samples, so to garner the most accurate results, use a stop-watch instead of a standard kitchen timer. Instead of throwing away the liquid mixture, allow it to cool and become a useful art supply once again. To add a second component to the crayon comparison project, time how long it takes each brand of crayon to return to a solid state. Once you stop stirring the melted crayons and remove them from heat, they will harden within minutes. Use empty egg cartons as molds to hold the hot wax while it cools. Once cool, peel away the egg carton and have chunky and colorful crayons to use in the classroom or as a take-home treat for students. Silicon baking molds can also be used as liquified crayons molds. If you continue to stir the mixture until it is slightly cooler, you can pour into metal cookie cutters placed on a baking sheet. Once hardened, push the recycled crayons out of the cookie cutters for use. Dodrill, Tara. "Science Project: Do Different Brands of Crayon Melt at Different Speeds?" Sciencing, https://sciencing.com/science-crayon-melt-different-speeds-7914095.html. 25 April 2017.